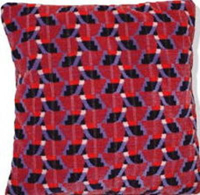 If you face a daily commute on the London Underground, the last thing you’ll probably want to come home to is a Recycled Tube Seat Cover Cushion. But for anyone who doesn’t regularly travel across London, then these cushions from Creatively Recycled Empire have a certain kitsch appeal. Creatively Recycled Empire worked alongside London Underground in a seven year waste management project, to recycle two tonnes of waste seat covers produced during train refurbishments. 5, 833 tube seats have been recycled in the project in total. Pictured here is the Vintage Northern Line cushion but there are plenty of lines to choose from, to match your décor or to commemorate your favorite journey. Cushions made from London bus seat covers are also available too. Most of the cushion cost around £27 and further details on how to order can be found on the Creatively Recycled Empire website.